For a long time now, I’ve been writing about the power of the “Social FAQ.” It’s a simple premise, really. If you want to garner trust and overcome objections, proactively answer the questions that your customers and potential customers have about you. This idea is echoed often by my friends Joe Pulizzi and Robert Rose of the Content Marketing Institute, and by Marcus Sheridan over at the excellent blog The Sales Lion. Incidentally, Marcus wrote the foreword to my new book (official announcement soon), where I talk more about these and other principles of utility marketing. So now, on the last day of 2012, I’ve decided to end the hypocrisy and actually create a social FAQ for me and Convince & Convert. I asked people on Twitter and Facebook what they wanted to know. Here are their questions, and answers from me. I added a few questions of my own that seemed relevant. If you have more, please put them in the comments, and I’ll do a Part 2 post if we have enough to work from. Jonathan and Dan, Convince & Convert was started in 2008. For a year or so it was just me. Then I added my part-time assistant Jess Ostroff – who is now Managing Editor of this blog, our Social Pros podcast, our daily email newsletter and our eBooks. (Jess also works with other people, so if you need help, ask her). As my consulting and speaking opportunities increased, I grew the team correspondingly. By no means is Convince & Convert just me. There are six of us that work on Convince & Convert at least half-time. Everyone involved is an experienced digital and social marketer, and all of us have worked in agencies, which is critical as we provide advice and counsel to many agencies as part of our consulting services. The About Us section has bios on the team. In terms of my personal involvement, I am in charge of business development for the company, am the primary content creator (although everyone pitches in), set overall strategy and am the day-to-day client contact for the vast majority of our consulting customers. The Convince & Convert team gets involved in a ton of strategic, operational and tactical advice and counsel for our corporate and agency clients. Each of us has slightly different areas of expertise, but our business model dictates that we are pretty much Swiss Army Knives of digital marketing. It’s a completely virtual company, with team members coast-to-coast. We get together twice a year to plan strategy. Otherwise, it’s all Basecamp and GoTo Meeting. Adam, this if the fifth marketing services company I’ve founded or managed. When I started Convince & Convert, I decided to change the business model and structure to hopefully remove the elements of agencies that I don’t like, and add more of the elements I do like (and produce good work). For example, we are not an agency, and almost never do much in the way of tactical execution. Our job is to take our clients’ social and content programs from good to great. All of them already have agencies (or are agencies). One byproduct of that approach is that we don’t track our time slavishly the way most agencies are forced to do. Consequently, I don’t have a definitive answer to exactly how my time is spent. However, it’s approximately 50% client work, and 50% content/speaking. It varies seasonally, as speaking is pretty much a Spring and Fall program. It also varies annually, as 2013 will be a big speaking year with a new book out. The pie chart shows how our actual revenue broke out for 2012. It’s five questions in one from Elissa! On the consulting side, we sell social media and content marketing audits; social media and content marketing strategic plans; and social media and content marketing metrics/measurement programs. Those are all large, one-time deliverables. Fees range from $10,000 to $40,000. We also provide ongoing, on call advice and counsel about all manner of social and digital and content issues to corporate and agency clients. These monthly retainers range from $3000 to $5000 per month. Our consulting section has details, including information about our clients (who are some of the biggest and best in the world). I’m not sure anyone is a fraud, just less informed or under experienced. I wrote about this a while back in this post: Clowns, Charlatans and Social Media Name Calling. My biggest business challenge is to continue growing Convince & Convert while maintaining the freedom I’ve worked very hard and very purposefully to attain. It’s a good problem to have. I keep good talent by not “keeping” any talent. Everyone that works with Convince & Convert (except me) is technically a freelancer. All of them have their own clients and their own projects in addition to the work we do together. I find people who are super smart, who want to live a business lifestyle that’s rooted in freedom and virtual collaboration, and who want to team up like The Avengers to do good work for amazing companies. I don’t hire, I combine. I’ve been getting this question lately, so I figured I’d answer it here. Because we are a strategic consultancy, our true competitors are other consultancies. But because we have an unusual (but purposeful) structure and business model, we are slightly different than most. In short, we are Altimeter Group without the research, Dachis Group and SideraWorks without the social business focus, and Edelman/WCG without the agency structure and overhead. We’re also Likeable Media and Vaynermedia without the tactical side. We are social and content accelerators, helping companies take their programs from good to great. On the blog front, we of course compete for your attention with thousands of individual and group authored publications. Some of my personal favorites are Social Fresh, Content Marketing Institute, Copyblogger, Social Media Examiner, Brian Solis, Social Media Explorer, SpinSucks, Grow, Awaken Your Superhero Occam’s Razor, Six Pixels of Separation and Brand Savant. On the podcasting side of the house, we compete for your aural attention with dozens of shows of similar intent, although we try to keep our format very consistent and focused on social media and content professionals. Thematically similar podcasts I enjoy include Six Pixels of Separation, Marketing Over Coffee, The Beancast, Social Media Marketing, Social Triggers, and MarketingSmarts. I also like CC Chapman’s video show PassionHitTV. Yes Chris, we typically have posts set up here on the blog two or three weeks in advance. My time horizon on content creation has changed a TON in four years. When I first started this blog, I had (like all new bloggers) zero readers. Then I convinced my Mom to read the blog, and so forth. Because I didn’t have nearly as many consulting or speaking opportunities, I had more time to devote to the blog on a daily basis. What I used to do was get up early and see what the hot issue of the day was in social media. Then, I’d write a post with my take on that issue. I would then go to all the blogs that were covering that issue, and drop a (theoretically) smart and productive comment, with a link back here. This got me “known” as a commenter on existing blogs, and generated early traffic. I spent at least three hours a day doing this for more than six months. During that period, I was fortunate enough that Jason Falls tweeted a couple of my blog posts. Jason was the first “name brand” blogger to shine a light on my work, and I’m eternally grateful. Chris Brogan was the second, and he tweeted this post I wrote a long, long time ago about Janelle Monae (the singer) and lessons the PR industry could learn from her approach to business. It’s so rudimentary that I’m almost embarrassed to link it, but in the interest of full disclosure, here you go. Now, I write one or two posts a week, instead of three or four. Our great team of guest bloggers brings other content to our readers that I don’t create personally. We also create a written transcript blog post of each of our podcast episodes. Based on priorities, realities, and strategy I have decided that Convince & Convert will not (and cannot) compete in the daily, granular social media news and advice space in any sustained and meaningful way. Social Fresh, Social Media Examiner and many others do it so well, there’s no point in trying to wade into that pool, even though it generates huge readership when done correctly (as they have). Instead, our focus here is on how it all fits together. How social and content and digital work together to drive better strategy and business results. It’s not always true, of course, but my objective is that everything you read here you’ll only read here. We want to be the Subaru of digital marketing blogs: different on purpose, and those who like it, love it. In that way, I’d say we’re most like Mitch Joel’s TwistImage with a narrower focus, or Mark Schaefer’s Grow with a less involved reader community. So, because we’re not trying to be real-time, we have the opportunity to look a little further out and plan content in advance. That’s not to say the content beast isn’t still hard to tame, but it helps having a Managing Editor tasked with making the trains run on time. Margie is a long-time reader and supporter. Incidentally, she analyzed her Twitter account the other day and discovered I was her very first follower. That made me feel good, as she’s a smart lady with a kind heart. I hope I’ve been able to help her a bit in the same way Falls and Brogan helped me. I came up with “Convince & Convert” in 2007 when I was deciding what to do after my employment agreement expired. For clarity, let’s wind back the clock a bit. I grew up in Lake Havasu City, Arizona which has the dual distinctions of being both the hottest city in the U.S., and the American home of the London Bridge. I graduated Phi Beta Kappa in political science from the University of Arizona. I attended as a Flinn Scholar, a full-ride scholarship awarded to the top 20 high school seniors in the state. While at UA, I was the President of the student union, and oversaw the production of something like 300 events each year. I also co-founded the university’s student radio station, KAMP, which is still on-air. I started my professional career as a political consultant, managing campaigns for state-wide, Congressional, and gubernatorial races. I recognized after a while, however, that the nomadic lifestyle of the politico wasn’t conducive to marital bliss or family harmony, so I made the move into marketing and public relations, working on projects for PepsiCo, Anheuser-Busch, and other major companies. For a few years, I was the marketing guy for Waste Management, Inc. for the southwest region, and to this day I can tell you more about landfill design and recycling nuances than ANYONE else in social media and digital marketing. I also took an ill-fated turn on the government service merry-go-round, working as the spokesman for the Arizona Department of Juvenile Corrections (I am not making this up). My primary job was to give tours of juvenile prison. Indeed, that was just as fun as it sounds, and my government career lasted approximately 120 days. When I’d given just about enough prison tours to go crazy, I was saved by my friends from college who had started the very first Internet company in Arizona, Internet Direct. They needed marketing help. I needed any job other than the one I had. Perfect! I became in 1994 the Vice President of an Internet company without ever having been on the Internet. Our co-founder invented virtual Web hosting. Before he created the partitioning algorithm, you had to have a separate web server for each domain name. This of course was quite an advance, and we grew from a few customers in Arizona to thousands of customers in 23 countries in approximately 8 weeks. The company ended up being sold to Mindspring (which is now Earthlink). I next became the co-founder and General Manager of azfamily.com, a pioneering local content website and Web design firm. At one time we were the second-largest local TV station website in the U.S., doing many millions of page views monthly. These were such early days of the Web that I literally outlined the first site structure on a paper plate in my backyard. In addition to our content site, we worked on major Web design projects, most notably John McCain’s website when he ran for President the first time, in 2000. Shortly thereafter, the company was sold to BELO Corporation (a publicly-traded media conglomerate). I moved on to become senior VP for visitalk.com, a voice and video over IP startup that was essentially Skype several years before Skype existed. The dot com bust happened right about then, so I opened my own firm. My company, Mighty Interactive, became a leading digital agency in the southwest, being named Arizona’s best digital firm for five consecutive years, and winning many national and global awards. We did great work for many leading companies, and sold the firm to integrated agency Off Madison Ave in 2005. OMA is an excellent agency – we still work for them to this day – and part of my acquisition agreement was that I would help manage the combined firm for three years. I had originally planned to take a job as a marketing professor when that time was up, but the simultaneous collapse of the real estate and stock markets in 2008 put that plan on the back burner, and I decided to start another consultancy. The original idea was to open a results-optimization firm, focused on A/B and multi-variate testing of landing pages, email, and online advertising. Somewhat similar to what Site Tuners is doing today. I came up with “Convince & Convert” to describe what that business would do for consumers: convince them the product or service was of value, and then convert them through testing and optimization. I ultimately decided to focus the company on a different part of the marketing ecosystem, and fortunately the name is just as applicable to the social media and content marketing evolution. Our logo was designed by my friend Chris Bohnsack of Bohnsack Design in Tucson. Chris worked with me waaaay back in the azfamily.com days, and we still work together. Recently, he created our awesome Power Of Everything ebook. The logo won a bunch of design awards, and we were a little shocked when Comedy Central came out with a new logo that is strikingly similar. I actually thought about making a stink about it, but figured it would be an expensive, losing proposition. I talk about being hype-free here on the site, and on my various bios around the Web. What I mean by hype-free is that I (and we at Convince & Convert) are dispassionate about any particular technology, social network, or newfangled thing. We are businesspeople first, marketers second, digital marketers third and social and content marketers last. I’m not a cheerleader, I’m a consultant. The goal is not to be good at social media; the goal is to be good at business because of social media. I have worked as a professional in these industries: radio, TV, newspaper, magazine, event management, political campaigns, email, Web strategy, Web design, SEO, PPC and online ads. I won’t hype social media or content marketing disproportionately because they aren’t worthy of it. They are new tools to be used to solve age-old problems. I will acknowledge that an area where I struggle a bit with the “hype-free” mantra is with my investments and sponsors. I am an active angel investor, and have a stake in tools you may know like Buffer, Pagelever, cmp.ly, Addvocate, Little Bird and more. Also, we have three or four sponsors at any given time here that help underwrite the blog, podcast and our email program. I both want to and have to promote my investments and my sponsors, but try to do so with facts over fluff, and by always disclosing my relationships. @jaybaer 1) do you have a financial interest in any tequila companies? 2) are you a paid spokesman for the fast food industry? As much as I’m on record as a tequila guy (part of my Arizona roots, I suppose) I do not have a stake in any tequila companies. But if anyone is interested, call me! On fast food, I’m a lover (although cutting way back as part of my fitness regime this year). But I am fascinated by the industry. It’s so competitive, changes so often, and they have such high demands for consumer engagement, that the fast food folks frequently make for good case studies (like this interview of Rick Wion from McDonald’s). @jaybaer What social dashboards/tools do you use? That might be a decent one. Indeed it is, Wes. I’ve written a post about tools I use but it’s been a while. I use Argyle Social and Buffer for posting content to social networks. We use Basecamp to manage all facets of Convince & Convert consulting. I also use Woobox and Agorapulse for Facebook page management and contests. I use Pagelever for Facebook stats, with augmentation by Zuum Social. We use Infusionsoft for our newsletter and Feedblitz for our RSS and blog posts via email. Most of our metrics we calculate by hand, using Excel. It’s usually the best way. Good question Anna, and are you trying to tell me something? I don’t know that I’ve ever been called a “fake” per se, but indeed I’ve had a few scraps in social media where people disagreed with my perspective, my expertise or my motives. The reality is that even though I advise many companies on how to handle negativity in social media, I am massively inadequate at it personally. I do not take criticism well, and I do take it personally. Both are bad qualities that I’m working on fixing. I year or so ago I had a brief period where I really felt I was getting beat up unnecessarily. I asked Chris Brogan about it, as he has faced a lot of praise and criticism over the years. He explained that if people are taking shots at you, whatever you’re doing is working. You’re not status quo, and you’re having an impact. That said, he reminded me, you have to be careful that an expanding public persona and claims on your time don’t squash the qualities that helped you break through to begin with. That was one of the most useful five-minute conversations I’ve ever had. That’s the real genius of that guy. He’s like Seth Godin in that he can say so much with so few words….unlike this post. Hey, a second question from Jonathan. He should get a prize! In an area like social media and digital marketing, I’m not sure “factually correct” is the right bar to clear. It’s more like “a known best practice, at least for today.” There is no absolute truth in this business, and looking for it will drive you crazy. I’ve said this before, and I mean it: everyone is a teacher and everyone is a student. The consultant or “thought leader” (I really hate that term) that believes they have nothing left to learn is a fool….and dangerous. In my case, the good news is that I’ve been an online marketing consultant for more than 18 years, and started before there were even Web browsers, or Yahoo! or really much of anything. It’s definitely easier to stay on top of things when you started at the Big Bang. In fact, for reasons that are too complex to go into here, I actually was doing pretty serious marketing consulting (not online of course) when I was 18. I definitely understand the concept of reaching a confidence tipping point where you feel like it’s okay to make recommendations. I am extremely fortunate in that I’ve just always done it. Now in terms of influence, that’s a different story. I still am amazed by it, and struggle with it sometimes. What I write or tweet or whatever can have an impact on a lot more people than when I was a consultant in the pre-social media days. That’s a double-edge sword. It’s nice to find your ideas creeping into other peoples’ presentations and blog posts and podcasts, but it’s also scary because if you tweet or write something stupid or offhand, the Internet never forgets. We should all have three “erase forever” buttons that we can press at any point in our lives that will fully delete the incident from the Web. Like those Men In Black flashlight things. As you might have surmised, Kelly worked with me at Mighty Interactive and Off Madison Ave, and is in a 200-way tie for first place among all the people I’ve hired. (not really, she’s beyond fantastic). Greatest life accomplishment has been to raise two thoughtful, happy and healthy kids who I believe will become good people. They are 14 and 11 now. Enough time in the oven that some things are set in stone, but still plenty of time for me to screw them up, so fingers crossed. That is tied on the accomplishment scale with the 22 years (20 married) I’ve spent with my incredible wife, Alyson. Maybe someday I’ll regale you with the tale of our decidedly one-sided courtship, but the truth is that I’ve never worked as hard before (or since) as I did to get her to marry me. Truly, all I am and all I have is because of her. She handles about 98% of our lives, which enables me to focus on stuff like writing 5,000 word blog posts over the holidays. Professionally, I’d say publishing a book was definitely a bucket list item, and I’m even more excited about the next one. But beyond that – and it’s funny that Kelly asked this question – is that I’m so, so proud of the success of the dozens of people who have worked with me in the past 20 years. At least 15 of them have their own companies, and others have gone on to incredibly exciting corporate careers and other adventures. There’s nary a flameout among them. I succeed vicariously through them. In terms of “making it” I’m already there. I define business success in just one way: the freedom to do what you want, for whom you want, when you want. If you can make that work, the money and accolades and opportunities follow organically. I’m not the guy to ask about that, Charlene. CC Chapman is much better at it than me, and I highly recommend his book Amazing Things Will Happen. The reality is that I am not the world’s best father or spouse, period. I could say it’s because my job does not allow it, but that’s untrue. I created this job and this lifestyle for myself from scratch. I choose to do the things I do professionally because I like them and I’m good at them. Nobody is forcing my hand. But, as much as my time away (either physically distant or emotionally so) steals from my family, I hope it pays them back in other ways. We’re spending two weeks in March as a family in Australia, for example, as I’m going over there for some speaking gigs. It’s not optimal. But I do the best I can, I have a world-class wife, my kids understand and I’m past the guilt phase. As Denise alludes to, I live in Bloomington, Indiana. I moved here in August, 2010 after 40 years in Arizona. Considering that this is a virtual company, I can theoretically live just about anywhere. You might expect that I would gravitate toward a more obvious location for a digital marketing consultant, such as San Francisco, New York, Chicago, Boston or Austin. But as enriching as those places are, they are not my style. I grew up in a small city, and that is the atmosphere my wife and I choose for our family. I have an entire post on how I used online databases to pick Bloomington (even though I’d never been here, and didn’t know anyone), but the summary is that it’s a classic college town with a very high cultural level in a city of just 100,000 people. Plus, the weather is pretty decent (by midwest standards), and a major factor for us is the central location. It makes flying around North America for speaking engagements easier. We love it here. We’ve made tons of great friends, our kids are doing well and the Hoosiers are experiencing a basketball renaissance. As a proud occupant of the IU bandwagon, I have season tickets this year. 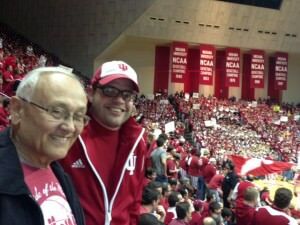 Here’s me and my stepdad at the recent game where the Hoosiers stomped the UNC Tar Heels. 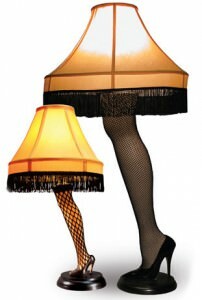 Jenna is a former Off Madison Ave colleague too, which is why she remembers the Leg Lamp. Indeed, my dear friends Mike and Kim Corak gave me a miniature version of the famous lamp from Christmas Story as a gift. Mike now runs content marketing agency Ethology, and Kim is part of the Convince & Convert team, in charge of special projects and client happiness. The Leg Lamp was proudly displayed on my desk at OMA for several years. Alas, it ceased illuminating a while ago. Plus, now that I’ve moved to a treadmill desk, the leg lamp would b a little too top-heavy for safe display. On the book, I always knew I wanted to write one. But I didn’t think I could make it happen without someone else to hold me accountable. Way too easy to find ways to spend you time NOT writing a book! So I approached Amber Naslund – whom I originally met on Twitter, and then in-person at conferences – about writing a book together. She had been thinking about it too, and we realized our ideas were very compatible. Meanwhile, Scott Stratten (who wrote UnMarketing and the Book of Business Awesome) told his editor at John Wiley & Sons, Shannon Vargo, that I was thinking about writing a book, and that they should publish it. Scott has always been a good friend and a huge supporter of my work. Wiley contacted me and asked to see a proposal. Amber and I whipped one up, and voila! a book deal. I realize it’s not usually that easy, but we were very lucky, and The NOW Revolution was released in February, 2011. It was one of the first books about social business. So much so, we don’t even use that term in the book. I re-read it the other day, and am so happy that it’s still very, very relevant. We worked hard to make it a book that will stand the test of time – a real risk for authors in this category. Ironic side note is that the outline for the book was created by Amber and I at Off Madison Ave in May, 2010. Ah yes, Kelly. Glad you asked. My somewhat famous bottle opener business cards made their debut at South by Southwest 2009. I’m on version 5 now, and continue to make small tweaks each time I print them. I do 288 at a time. They cost about $3 each. But, they are a three dimensional example of Youtility (per my new book), they have a built-in “talk trigger,” and people do not lose them. I get comments at events like “I still have that card you gave me a couple years ago, it’s in my boat.” Hey, if you know precisely where my business card is among your personal possessions, my job is done. There’s no great story behind them. I was looking at a specialty item website, and saw credit card sized bottle openers (blank) and thought they could become a very interesting business card. I worked closely with my friend Dan Corredor at Asylum-Pipeline to source them and get them printed and bagged. If you don’t have one, find me at an event and I’ll hook you up. As to their weight, yes they get heavy. If it wasn’t such a fashion crime, I’d get a fanny pack. If you’ve read this far (Mom) thanks sincerely for your time, attention, and support. It’s been a remarkable 2012, and on behalf of all of us at Convince & Convert, I wish you a healthy and prosperous New Year.